Fireflies and Jellybeans: One Lovely Blog Award! 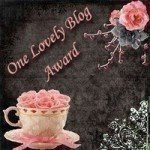 We got the One Lovely Blog Award from Creative Itch! Thanks Misty! 1.) Accept the award, post it on your blog together with the name of the person who has granted the award, and his or her blog link. Thanks Misty for the wonderful Award! We are honored!